It’s that time of year again! Toronto’s Festival of Beer is back, and celebrating its 18th year of being the most infamous beer festival in Toronto. 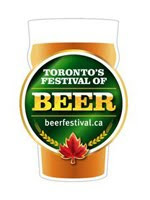 Known for being the event that brings together beer lovers and connoisseurs alike, as well as good food, drink and entertainment, nothing says ‘summer’ like Toronto’s Festival of Beer. Fans of the golden beverage will gather at Bandshell Park at Exhibition Place this July 27th – 29th for an astounding selection of beer and gourmet fare. Attendees will be able to sample brews from diverse locales spanning across the globe. They will also be able to find numerous beers from close to home, including a number of brands from the Ontario Craft Brewers. But what’s great beer without great food to go with it? Patrons will once again be able to enjoy the ever popular “Napoleon Gourmet Grills Grilling Tent”, showcasing some of the top culinary artists in the Greater Toronto Area and their meat creations — whether cured, smoked or grilled fresh. Some of the top chefs scheduled to appear in the Grilling Tent (and their restaurant) include: Rodney Bowers (Hey Meatball and Host of Food Network’s Delinquent Gourmet), Craig Harding (Host of TLN’s Opening Campagnolo), Ted Reader (Ted’s World Famous BBQ), Mark Cutrara (Cowbell), Rob Rossi (Bestellen and Top Chef Canada Season 1 – second runner-up), and Christian Pritchard (Gastro-Entertainer and TV Personality) to name a few. While the main focus of the Festival will be beer, the acts scheduled to perform are not to be missed. The Main Stage will be graced with outstanding musical talent such as Salt-N-Pepa, Gentleman Husbands and Big Wreck! Ideally located in downtown Toronto along the scenic shore of Lake Ontario, Bandshell Park at Exhibition Place provides convenient access to TTC and GO Transit links. Increased access to public transit allows the Festival to further support their message to brewers and consumers alike; Respect Beer. Respect Yourself. Drink Responsibly.